For more than 30 years, PG&E has built a strong record of working with customers to deliver both cost and energy savings through energy efficiency. Our results demonstrate that energy efficiency offers both the fastest and lowest-cost way to meet growing energy demand while minimizing greenhouse gas emissions. In total, PG&E’s programs have avoided the release of more than 168 million metric tons of carbon dioxide (CO2) into the atmosphere, based on cumulative lifecycle gross energy savings. Our customers fund these programs through “public purpose program” charges embedded in gas and electric rates. This funding allows us to offer customers a wide array of programs, services and campaigns that include a mix of rebates and financial incentives, training and education, support for new and emerging technologies and other activities, such as advocacy for stronger building codes and appliance standards. One of the key factors in California’s success with energy efficiency is a regulatory policy known as decoupling. Decoupling helps remove the financial incentive most utilities have to sell more energy because it provides for fixed utility revenue levels independent of actual energy sales. Due to decoupling, rather than focusing on growing energy sales, PG&E can focus on aggressively pursuing efforts to reduce energy use without the disincentive of a significant financial loss. Moreover, the state of California offers utilities the opportunity to earn a financial benefit in return for achieving ambitious customer energy efficiency targets. Utilities can also incur penalties if goals are not met. This combination of decoupling and incentives continues to drive significant gains in energy efficiency. PG&E’s gas and electric energy efficiency programs and goals are authorized by the CPUC on a three-year program cycle. For the 2010 to 2012 cycle, we have a budget of $1.3 billion—the largest investment in energy efficiency by any U.S. utility. PG&E’s savings goals for the three-year period are 3,110 GWh, 703 MW and 48.9 million therms. 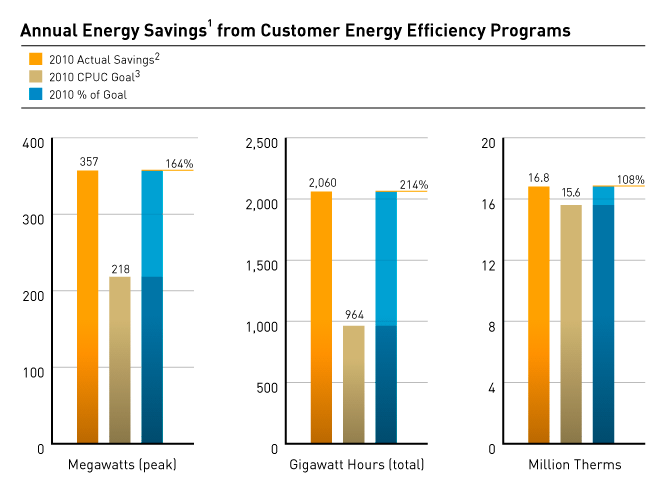 PG&E exceeded the CPUC’s energy savings goals for 2010—achieving savings of 2,060 GWh, 357 MW and 16.8 million therms. These results helped save customers more than $332 million on their energy bills and avoided the emission of more than one million metric tons of carbon dioxide (CO2) and more than 200 tons of nitrogen oxide (NOX). PG&E can earn a financial incentive for achieving the CPUC-approved customer energy efficiency targets. In recognition of the successful results from the 2006 to 2008 cycle, the CPUC awarded PG&E’s shareholders a total of $104 million in incentives. Click on the links below to review various charts showing customer energy savings and the associated avoided emissions. 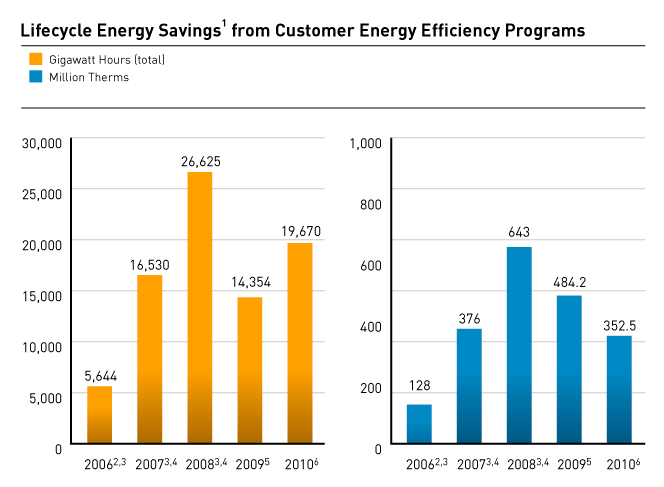 1 Annual energy savings refer to the first-year impacts associated with installed customer energy efficiency projects. 2 Data (gross energy savings) is taken from Table 1 of the 2010 Energy Efficiency Annual Report, filed with the CPUC on May 2, 2011. 3 Source is CPUC Decision 09-09-047. 2 Data (net energy savings) is updated from Tables 1 and 2 of the Energy Efficiency Program Portfolio Annual Report for 2006, filed with the CPUC on November 15, 2007. 3 Net actual energy savings, as measured against net energy savings goals for 2006 through 2008 established in CPUC Decision 04-09-060. 4 Data (net energy savings) is updated from Tables 1 and 2 of the Energy Efficiency Program Portfolio Annual Report for 2007 and 2008, both filed with the CPUC on May 1, 2009. 5 Data (gross energy savings) is derived from the 2009 4th Quarter Report to the CPUC, dated March 26, 2010. The gross energy savings are measured against gross energy savings goals for 2009 through 2012 established in CPUC Decision 09-09-047. 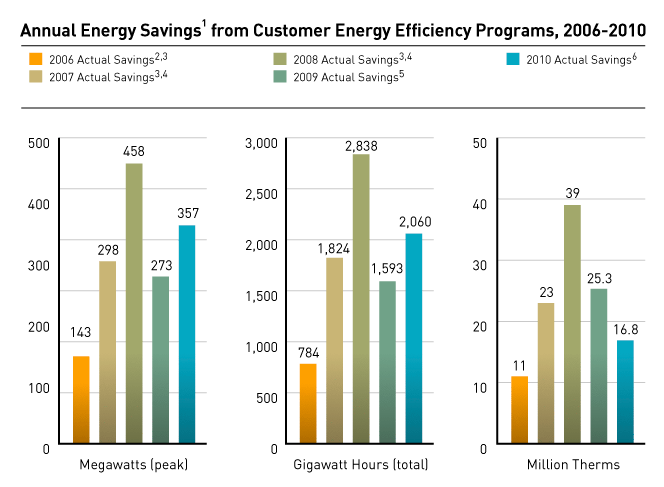 Prior to 2009, energy savings were measured in “net” energy savings. 6 Data (gross energy savings) is taken from Table 1 of the 2010 Energy Efficiency Annual Report, filed with the CPUC on May 2, 2011. 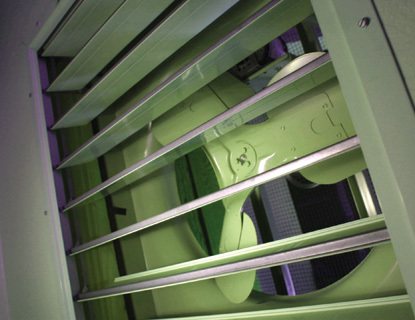 1 Lifecycle energy savings refer to the estimated energy efficiency savings over the expected lifetime of the installed customer energy efficiency projects. 5 Data (gross energy savings) is derived from the 2009 4th Quarter Report to the CPUC, dated March 26, 2010. The gross energy savings are measured against gross energy savings goals for 2009 through 2012 established in CPUC Decision 09-09-047. 6 Data (gross lifecycle energy savings) is taken from Table 1 of the 2010 Energy Efficiency Annual Report, filed with the CPUC on May 2, 2011. 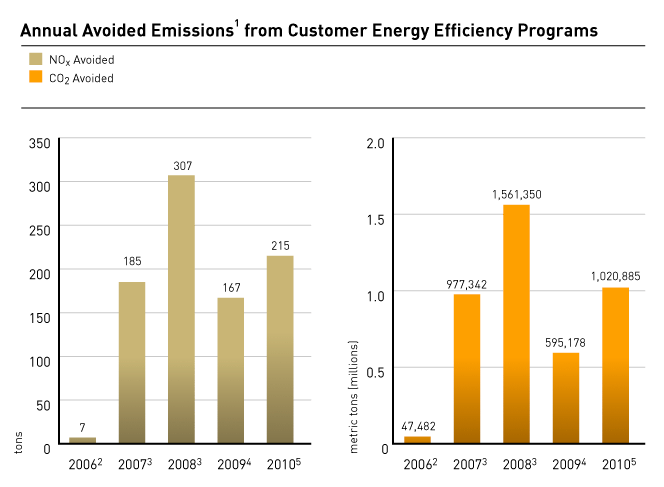 1 Annual avoided emissions refer to the first-year impacts associated with installed customer energy efficiency projects. 3 Data (net energy savings) is updated from Tables 1 and 2 of the Energy Efficiency Program Portfolio Annual Report for 2007 and 2008, both filed with the CPUC on May 1, 2009. 4 Data (gross energy savings) is derived from the 2009 4th Quarter Report to the CPUC, dated March 26, 2010. The gross energy savings are measured against gross energy savings goals for 2009 through 2012 established in CPUC Decision 09-09-047. 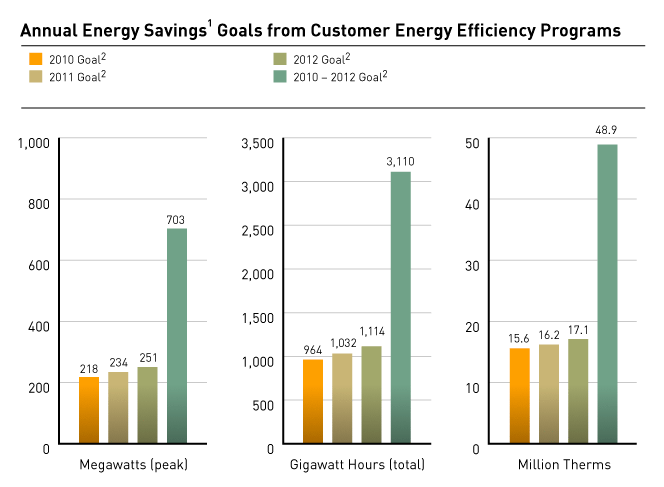 Prior to 2009, energy savings were measured in “net” energy savings. 5 Annual tons of CO2 and NOX avoided are taken from Table 2 of the 2010 Energy Efficiency Annual Report, filed with the CPUC on May 2, 2011; the figures above also include updated data filed in June 2011. 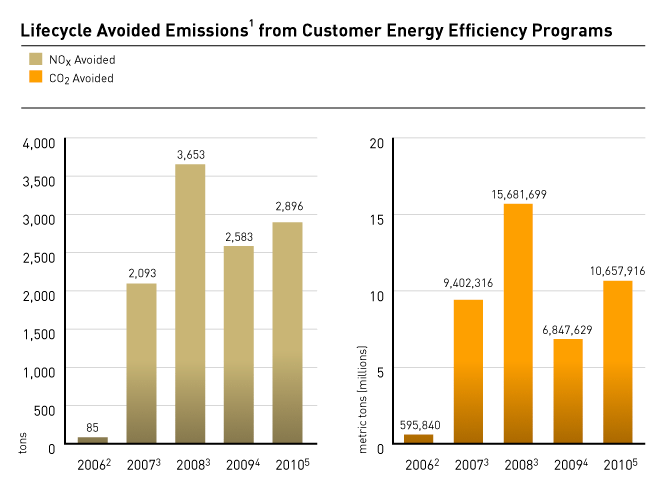 1 Lifecycle avoided emissions refer to the estimated avoided emissions over the expected lifetime of the installed customer energy efficiency projects. 5 Lifecycle tons of CO2 and NOX avoided are taken from Table 2 of the 2010 Energy Efficiency Annual Report, filed with the CPUC on May 2, 2011; the figures above also include updated data filed in June 2011. 2 CPUC Decision 09-09-047 established gross energy savings goals for 2009 through 2012. PG&E is sharing more than 30 years of energy efficiency experience with community colleges across northern and central California through the PowerPathway™ Energy Efficiency and Renewables Training Network. Through this private-public partnership, we are helping community colleges from Fresno to Sacramento leverage the equipment, training material and expertise at PG&E’s San Francisco and Stockton energy training centers. In return, Training Network members use what they have learned and applied in their own programs to benefit other colleges in the state, passing along the knowledge and the means to expand established “green” curriculum across a broader geographical area. For example, in 2011 and 2012, Skyline College will work with regional partners to develop energy efficiency curriculum that is both standardized and recognized at other colleges and high schools. This will give students enhanced flexibility as they advance on their educational and career pathways. Additionally, Skyline is working with staff at the Pacific Energy Center, PG&E’s San Francisco training center, as well as other industry employers and community colleges to more closely link curriculum with employment needs, and to integrate hands-on field work into existing classroom activities. With more than 15 community colleges in the Training Network, the partnership is poised to help California build new careers while saving energy. Last year, PG&E laid the groundwork for two innovative approaches implemented in 2011 to help our customers better understand and manage their energy use. With Home Energy Reports, we offer information and tips to help residential customers make their homes more energy-efficient. Customers can review how their energy use changes over time and across seasons. They can also learn how their home’s energy use compares to approximately 100 occupied, nearby homes that are similar in size and have the same type of energy service. In each report, customers also find personalized tips to help them save money and energy—ranging from quick fixes to long-term investments. We began a phased rollout of the reports in 2011. We are also deploying a tool to help our largest commercial and industrial customers enhance energy management at both individual buildings and across entire fleets of buildings. The tool enables PG&E to show customers how their facilities compare in energy use to one another and to established industry benchmarks. These strategic insights will help our customers target energy efficiency improvements that will yield the largest energy savings and best return on investment. We plan to offer the tool for the majority of large commercial and industrial customers by the end of 2011. New energy-efficient LED street lights are benefiting Pittsburg, California. More than 20 cities have worked with PG&E on a smart and practical approach to energy efficiency—converting their street lights to light-emitting diodes (LEDs). 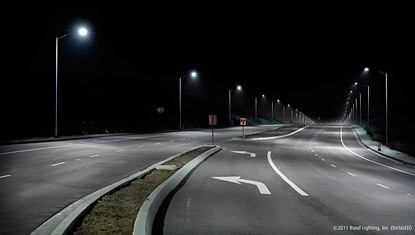 Compared with traditional street lights, LEDs use about 50 percent less electricity and last up to five times longer. Through the program, PG&E offers incentives to customers in our service area who own and maintain street lights and are on our LS-2 rate. Customers who replace or upgrade their existing street lights with new PG&E-approved LED streetlights are eligible for lower pricing and rebates. In 2010, 10 cities converted more than 3,900 streetlights to LED, saving more than 1.3 million kWh per year and resulting in rebates of nearly $700,000. For example, Pittsburg, California, slashed its energy use by converting more than 1,300 traditional streetlights to bright LED lights. PG&E provided the city a rebate of $116,775 to install the energy-efficient lights. The city will see energy cost savings of more than $67,000 in the first year. Chico earned rebates as well for converting more than 1,000 of its streetlights to LEDs and will see first-year energy cost savings of nearly $60,000. Learn more about the streetlight program and incentives. © 2011 PG&E Corporation. All rights reserved.